i am finding money all over the place,nice hugh? I cant look at the schedule...where to click? played the piano tapes and got a book from a girl. can t start the game!!! it doesn t load "completely"!! Heading to the right of the station found a flier and more money. Inside the saloon got an ace of spades, more money and talked to the bartender after using the piano. Now I have to collect some money for him. ok used the bomb on jail door . Miller, try zooming back and click on the street to the right. Lots of places to go, people to talk to and things to do there. @Miller It seems that things must happens in right order. Sorry I can´t help you more. For every thing you do there comes more views and things to do. At the hotel, got Ace of Hearts, a gun and mo'money. OK Miller, I bought the ticket, looked at the trains schedule, zoomed back and in again on the Aurora poster. Oh, and moved the clock hands to 1:45, maybe that? nope. still not working. I'll reload maybe that helps. but thanks for helping me. At the Sheriff: badge, money and made a friend whom I have to help out of jail. has anybody got the ace of diamonds,and if so where did you get it? Spent all the money I had for more stuff, lol. I don't even know what I'll need. Only whiskey was left to buy for me. bigtank do you remember where you got the ace of diamonds? Got a telegram from Aurora and the bar guy's money from the post office. Got the other hotel room key and the hint to escape on a trolley. guy in the jail says to set all town clocks to *pm. got in the shed and fixed wheel but can not leave as it is not night, look all over for clocks. only found post office. shop. train station. Have the envelope with money; but I can't get back upstairs at the Hotel??? Got the wheels by using the chest key now. i dont have ace of diamonds. Where is it? @Seawall, give the money to the guy in the Saloon. Thanks for the ace of clubs bigtank! Got now a tune #2 for the piano from the crying woman. how did you made a bomb ? And where did you guys found the ace of diamond ?? Ofcourse oty. I´ll tell you. Played the second tune and got Aurora's book from a lady at the Saloon. I don´t even found the jail. I guess that´s where my ace is. Where is jail??? Start combining the flier (paper) with gunpowder... I'm making a bomb! Yeah! Thanks, @Edgar, back at the Hotel and have the trolley wheels from the room next to mine. Now, where is the Ace of Diamonds? Put the bomb on the jail padlock, add matches = KAPUT! And inside the jail IS ace of diamonds! Buy thread, then you can finish the bomb, @Edgar. Played cards and won, but wheres my earnings?? Getting the guy out of jail with the bomb leads to the elusive Ace of diamonds. I think the game is glitched. I didn't get ANY money after playing cards and now I need it to buy the shed's key!! TRY NOT TO EXPEND ALL OF YOUR MONEY (maybe that triggers the bug) Will restart now. Turn left, enter the Sheriff's (rightmost door) and then enter the door on the left... jail is there. Adryanna, just buy the key. 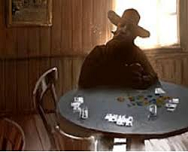 @Adryanna - after you play cards, a guy will appear at the door; have a conversation with him. Oty where is trolley and shed? @Madde - click on the building to the left of the train station. POP! Found shed and trolley left of station after set clock to 8 pm. Put on the wheels and nothing happend?? think there where 4 or 5 clocks. thanks, @oty; out of town now. I didn't have my screen scrolled down enough to catch all of the clocks! Good game! bigtank did you set the one above the piano in the saloon? OK, this game was a nice one, like Pastel Games usually are. Thanks all! I didn't notice it, hahaha. Well, good to know anyway! I just looove Skutnik games...they always give you the feeling that you've been in a completely different world for a while. Just awesome! So we escape by never seeing Aurora??? can someone please tell me how to get the piano tapes??? I removed the first tape..where is the second??? @Candibar, if I remember correct you need to give your train ticket to the crying girl and you'll get it from her. I did't find the crying girl...thanks for answering Ellie (hugs) can u tell me how to find her? Crying girl is in the leftmost door on the right side of the street. I think next to the hotel if I remember correctly. One of the best escape games!! Only help I needed was making the bomb. For once I found all the rooms! Anyone find use for pick, whiskey, badge, or rope? Was sending postcard necessary? The best grafic for me. Try Fog Fall or Submachine or others..
Great game! I had a lot of fun in that eerie little town! where is the gun powder for the bomb..? I don't get the clock in the shop to be on 8 o clock! Does anybody has an idea? This is one of the best game creators. Thanks a lot for this super game.